File this one under unlikely, but it’s an interesting rumour all the same – and one that carries some weight thanks to events in the comics. 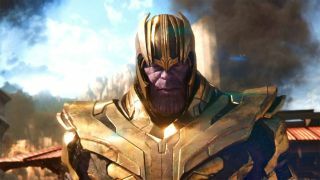 According to one potential whisper/leak, Thanos is going to appear in another MCU movie after Avengers 4: Endgame. According to 4Chan (H/T r/MarvelStudiosSpoilers), Thanos will “appear in some capacity” in Phase 4 MCU movie The Eternals. Yes, I know. 4Chan. But stick with me. The kicker is that this isn’t going to be taking place after Endgame, instead being set potentially thousands of years before The Snap in Avengers: Infinity War. The movie, too, could come out as soon as 2021. That, then, makes it more likely to happen – and a fascinating comic book link almost puts it into the realm of realistic. You see, in the comics, Thanos has a sibling. While we know all about Thanos’ daughters, adopted or otherwise, The Mad Titan hasn’t exactly been forthcoming – at least in the MCU – about a brother. There’s a pretty good reason for that. His brother, Starfox, is an Eternal – a race of superhero-like beings that existed millennia before the likes of Iron Man showed up. They’ve clashed several times in the comics and if Starfox does indeed form part of The Eternals in MCU’s Phase 4, there’s very little reason to doubt that his familial rival Thanos would be too far behind. There’s even been rumours of members of The Eternals showing up in Endgame themselves. That, right there, is a feasible enough link to tie the two. It’d be a pretty fun watch, too, and a way to get Josh Brolin involved as much as possible. After all, Starfox is the anti-Thanos. He has a silver tongue and is definitely far more easy and breezy than his purple-skinned bro. I can feel an awkward buddy comedy coming on, and it’s be a good a way as any to introduce The Eternals to audiences with Marvel perhaps wary of doing too much, too soon with a group of magical, invincible beings. The list of new Marvel movies on the way suddenly got a lot more interesting, didn't it?